EastSouthWestNorth: "You Will Have To Die For Killing The Puppy!" "You Will Have To Die For Killing The Puppy!" (Southern Metropolis Daily) "You burned that dog to death and therefore I want you 'dead'!" By Wang Feng (王风). April 28, 2007. The place where the dogs stayed. 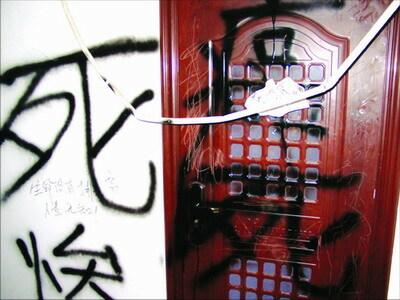 The apartment entrance of the family which burned the puppy to death. Someone holds the corpse of the dead puppy in front of the woman who did it. ... According to <Modern Express Daily>, on April 24, several men and women in the Xiaguan Huoyanyuan district of Nanjing brought Sprite bottles filled with gasoline and proceeded to the small garden behind building number eleven where one female dog and her two puppies made their home. They poured gasoline on the dogs and set them on fire with a lighter. According to one man: "The dogs yelped in the middle of night and disturbed the sleeping humans. The problem can be solved by killing them." During the process, one young male passerby rip opened a sealed exit and then the female dog which was on fire took out a puppy with her mouth. She got out and put out the fire on herself and that puppy. 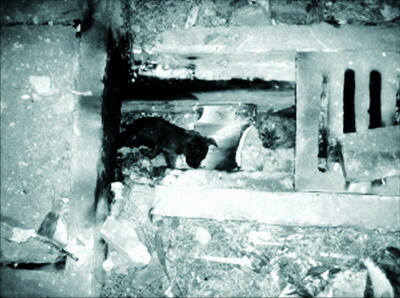 But she did not have time to save the other puppy because the man who set the fire re-sealed the hole. When the female dog went to bite the man, he hit her heavily. The female dog then sped off to Building Number Ten. One hour later, the reporter arrived at the scene in a hurry. The surviving puppy had crawled back into its lair. On the side, the dead puppy was curled up. It was blackened, but its eyes appeared to be still opened. "That is the building. The female dog is waiting motionless in front of his apartment door. She is staring at the stairwell. She recognizes people. That man is hiding inside his apartment." Mrs. Wang told the reporter in a low voice. During this past winter, the stray dog arrived at Huoyanyuan and made a new home in a small hole in the garden behind Building Eleven. According to people, this dog was very compliant with people who live there. But when she saw strangers, she barked loudly. Mrs. Zhang in Building Eleven was particularly pleased: "Ever since this dog came, there were no thieves. She was our dutiful watchdog." But other residents thought that the dog seriously interfered with their sleep. One netizen posted <Human rights and canine rights -- before and after the dog-burning incident> and said that she was 75-years-old and living in Building Ten: "This dog had no master. She ate and defecated anywhere without anyone to clean up after her. Worse yet, she started barking as soon as she saw a stranger, day or night. For a long time, I had not been able to get a decent sleep even after doubling the dosage of my sleeping medication." "Afterwards I asked Xiao Qi. Why did you have to set them on fire? Xiao Qi said: They had discussed with the owners before. Some of them did not want to evict the dogs because they serve a watchdog function, and they also gave a chance for charitable persons to express their kindheartedness. There were some disagreements and a fight almost broke out. We got very angry and we went too far." 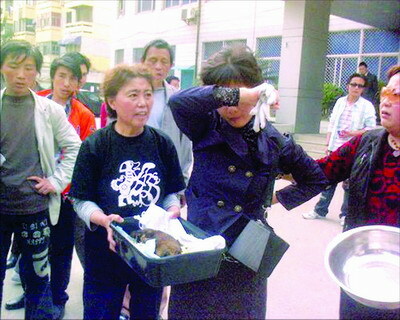 The burned dog and her surviving puppy were taken by animal rights protectors to the animal hospitals for medical care. Many residents and netizens have established an open-air altar to commemorate the dead puppy, together with wreaths made from fresh flowers. The incident has not ended. Someone published the real identity, work address, home address, office number and personal mobile telephone number of the person who set the dogs on fire. Many people waited outside the office of the perpetrator and harass her when she came out. They published photographs and videos of her on the Internet. The office of the perpetrator has received many protest telephone calls. Many people have signed letters to the mayor of Nanjing to put pressure on the perpetrator and her work office. Many people have issued death threats against this "murderer." Some other people have gone even further by painting the word "death" on the wall outside the apartment of the perpetrator. These photographs are broadly circulated on the Internet. When some netizens saw these photographs, they wondered if the incident has gone in the other direction: "When mine owners want to cover up a mining disaster or when government officials ignore human life, you people don't seem to be as excited. How come you become so when dogs are set on fire?" "You people are a mob. You paint the doors, you publish the address and telephone number. Who gave you such rights?" A Tianya netizen said: "You think about your violent actions calmly. You are not so different from the attitudes of the people who set the dogs on fire." But these doubts were quickly buried by the endless number of bloodthirsty comments. The perpetrator has called the police and wants to get police protection.